Spring is the best time for a Striper fishing trip with Finao Sportfishing. With the water warming up the Striped Bass begin to move into the Chesapeake Bay. Finao Sportfishing targets these fish from mid March till mid May. Our most recent Striper fishing trip we caught countless Striped Bass up to 35 pounds! 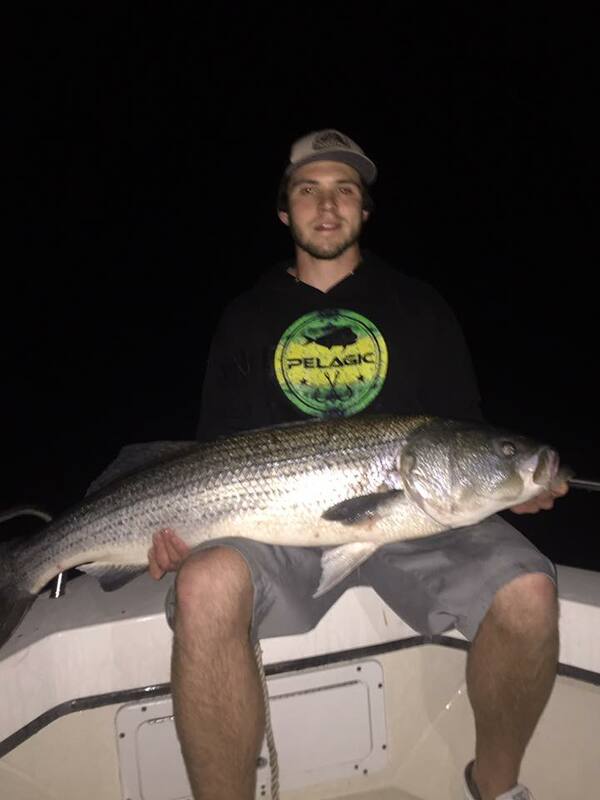 Click here to book your Striper fishing trip today! On our Striper fishing trip we were using artificial lures on light tackle fishing gear. Casting with light tackle for Striped Bass makes for an exciting fight! The fish this time of year are swimming up the Chesapeake Bay and into the Rivers to spawn. They are feeding on a variety of smaller fish such as Menhaden, Shad, and American Eels. Mimicking these bait fish with the proper artificial lure makes for a successful Striper fishing trip. We use many different lures but on Finao Sportfishing but we know there are some better than others. Swim baits, Bucktails, and Plugs are our most commonly used lures for Striped Bass. Our last Striper fishing trip left the dock of Vinings Landing Marina around 6:30pm. Leaving before Sunset is always good for Striped Bass because these fish feed more aggressively around Sunrise and Sunset. Once we arrived to our first location it was fish on! Within our first 5 cast we already caught a Striped Bass around 10 pounds. As the Sun set below the horizon the bite began to get even better. Fishing for Striped Bass is almost always better at night time. Striper are opportunistic fish that hide behind structure in the dark for a unsuspecting bait fish to swim past. The Chesapeake Bay Bridge Tunnel is our most common place to fish for Striped Bass. It provides rocks, pylons, fast currents, and lights which is perfect for Striper fishing. Our Marina is conveniently located only 3 miles from the Chesapeake Bay Bridge tunnel making it a short run to the best fishing. Be sure not to miss out on our Striper fishing trips in the Chesapeake Bay! Here is a picture of one of our Striped Bass from our previous trip.